I liked how Pastor S. Lewis Johnson emphasized the virgin conception rather than the virgin birth. He preached, as you will read below in part, that the birth was typical, human, bloody, and messy. It was the conception that was immaculate. 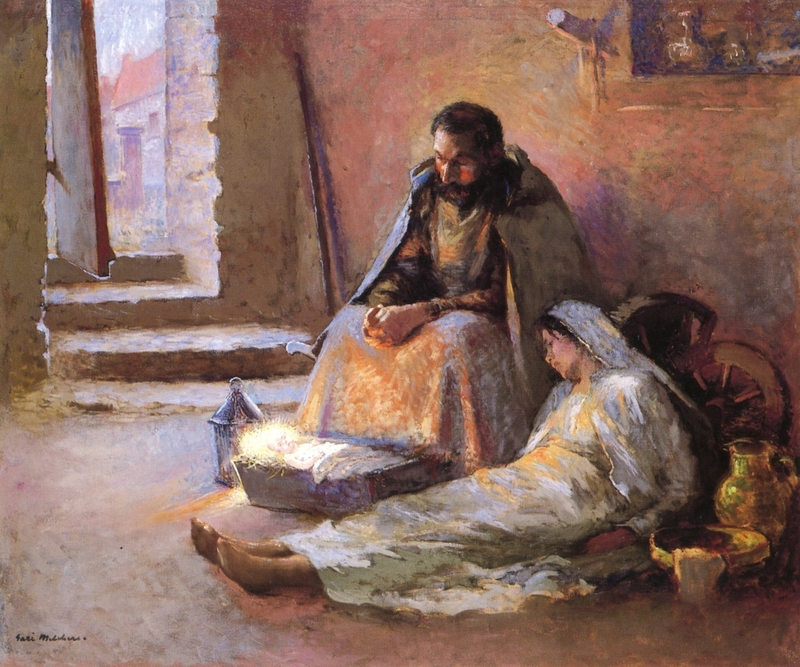 The art by American painter Gari Melchers depicts a scene more reflective of a birth than most nativity scenes usually do. Here, we see a deeply concentrating Joseph gazing at his newborn son, perhaps pondering the spiritual implications of this new life that promised to bring new life. Mary, exhausted, drooping, leans against her husband sleepily, recently used washbowl and cloth by her side. Is the glow from the Babe’s head, or the lantern that has been set by Him? The scene depicts exhaustion, wonder, light, and hope. Now apparently from the account, this is not stated directly, but apparently from the account, Joseph had learned of the pregnancy of Mary, whether he had been told this by Mary herself, whether he had discovered it and she had kept quiet about it the text does not say. I am inclined to think because of the statement that is made in just a moment, that Joseph was very much in love with Mary and that as a result of his love for her, the fact that she was pregnant caused a great deal of consternation to him. And I think, if I judge these characters correctly, that Mary had told him of the experience. But Joseph, like so many of us, when confronted with such a miracle and after all, there never had been anything like this before; the closest thing to it was the supernatural birth of Isaac in the Old Testament, but that was by natural means, and yet supernatural, I’m quite sure I can understand something of the wrestling that took place in the heart of Joseph. I can imagine that after he was told this that he spent many a sleepless night. He wondered perhaps, “Should I really marry this young girl?” That is, “Should our marriage be consummated and should be begin to live together?” If it’s not true, perhaps I should put her away according to the Old Testament law. If it is true, I hesitate to take her to be my wife for the simple reason that if this is of God and the Messiah is to be born of her, it seems almost unholy to begin to live with her. Now Joseph apparently was about to reach a decision, which meant that he was going to put her away. I gather that is the force of the text when he says, “And not willing to make her a public example was minded to put her away privily.” That is, he wasn’t going to do it publicly, but he was just going to take the minimum of two witnesses and carry out the divorce according to the Old Testament. So Joseph apparently had made up his mind. Now this, of course, is something that we can never really fathom. We can only adore. Who could ever understand what it means to be born of the Holy Ghost? G. Campbell Morgan used to say, “This is the holy mystery, the touch of God upon the simple life that made it forever sublime.” She was found with child of the Holy Ghost. That which is conceived in her is of the Holy Ghost. So in a restless night amid fitful sleep, Joseph had a visitor and the visitor told him in supernatural terms and direct language that this in Mary was of the Holy Ghost. Now what he meant by this was that the Spirit was the source of the vitalizing energy which gave to the embryo in her womb. Now I want to say something about the doctrine of the virgin birth at this point that I hope will help to clarify your mind some of the theology of it. Who would ever expect a simple New Testament professor and preacher of the word to transform the doctrine of the virgin birth so that everybody now understands it in a new light? So I’m not having any kind of sense of transforming all of theological thought concerning the virgin birth. But I do want to say this that the New Testament does not teach the doctrine of a virgin birth, the New Testament teaches the doctrine of a virgin conception, a virgin conception. In other words, our Lord Jesus was conceived by the Holy Ghost, but he was born naturally, born naturally. Now I want you to notice that I’m not denying the so called doctrine of the virgin birth. That would make nonsense of everything that I’ve said up to this point. I just want you to think clearly that it was the operation of the Holy Spirit in the conception that is referred to here, not in the birth. Jesus was born as an ordinary person was born. Praise the LORD for all His ways.